Hey, I’ll be in the middle of moving for the next couple weeks or so, so updates may be a little sporadic until things settle. As always, thanks for reading! Helvetica, always asking the important questions. Btw, I’m fangirling so hard about Heavens and Steak here, like Heavens is being so… supportive. Please tell me that Was a reference. His name is Buck, and he is there for the party. I hope you like your new home, Mr. Wiedle! So scary it gave a skeleton a heartbeat. wow. looks like their lives are really at steak now huh? Yeah. Heaven forbid Lucy doesn’t get there in time to help out. Maybe, but what ever happens we’re really going to get a bang for our Buck. *yelling* YO! I THINK SOME PEOPLE ARE TRYING TO USURP YOU OVER HERE, O PUN GOD! Pun God here, what is the issue? please, tell me Heavens and Steak are not gay. Why do you care? You aren’t against that sort of thing, are you? If you are, I suggest you get off the internet before everyone hates you. If anyone dares tell me that Heavens and Steak are not married then I will fight them. Dont forget the magic sheild!! Wow. I know that the comic is free but years have gone by since the first page. Years. Only Megatokyo drags more than this. That said, I do enjoy it but may give up on looking for updates. I didn’t mean it the way it sounds, it was past my bedtime! Well, honestly, I just want more of the story and the suspense is killing me! I am greedy and selfish. I will keep checking and try to be more positive. The comic is really good and I am too anxious for more I guess. Thank you for replying yourself, wow, I didn’t expect that. No worries! Thank you for reading! 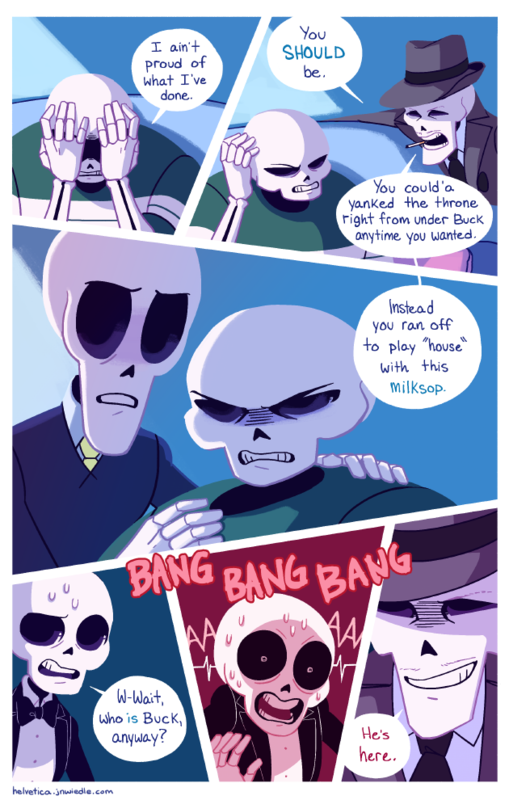 I’ve found this comic two days ago, and I already love it so much! Amazing art style, cute bones and interesting script. Can’t wait for more.